A series of on the 2012 presidential election, POLITICO’s Playbook 2012 provides an unprecedented real-time account of the race for the White House. The third edition, Obama’s Last Stand, follows the reelection campaign of President Barack Obama as it struggles to find the winning formula in a political landscape that has changed dramatically since his history-making victory in 2008. Though battered and bruised after nearly four years in office, Barack Obama remains the most competitive player on the field in American politics today. 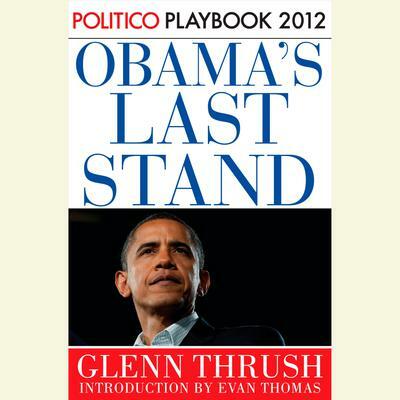 In Obama’s Last Stand, POLITICO White House correspondent Glenn Thrush chronicles the efforts of the president and his team to secure a second term in the face of a determined opposition, unfavorable economic headwinds, and a series of missteps by his own team. Yet apart from Romney and the uncertain economy, Obama’s greatest obstacle on the road to reelection may be Obama 2008. He and his team of talented advisers must try to reconcile their nostalgia for that once-in-a-lifetime campaign with the realities of an election fundamentally altered by the advent of super PACs and the evaporation of Obama’s superstar popularity. That challenge has led a campaign operation that once prided itself on flawless execution of strategy to commit several of the most dangerous unforced errors of Obama’s political career. Yet the game is far from over. If Obama is sometimes his own worst enemy, he also has the talent and drive to reclaim this race. Spurred on by the realistic prospect of losing, and growing ever more impatient with the foibles of his campaign staff, Obama the competitor is gearing up for the most critical fourth quarter of his career. This is the story of the last stand that will either cement his legacy forever—or consign him to a roster of once-promising one-term presidents.